New Zealand’s largest city has a diverse population of 1.5 million. Regularly rated as one of the world’s most liveable cities, Auckland has a laid-back vibe, straddling two kinds of coastline: white-sand beaches on the Pacific Ocean and black-sand beaches on the Tasman Sea. Long ago this city was called Tāmaki Makaurau, which means ‘a coveted area’, fought over by many tribes due to its rich soil, beautiful beaches and abundance of seafood. Today it has a vibrant dining scene and festivals as well as a strong sports culture, with access to the country’s islands, wineries and great beaches. The city enjoys a warm climate, superb waterfront setting, a thriving economy, buzzy harbourside restaurants…. Aucklanders have seen first-hand how events can transform a city, with Auckland hosting the likes of the ICC Cricket World Cup and FIFA World Cup. Good transport, infrastructure and accommodation, and government and public support help in making this a great sports city. It encourages an active lifestyle, and a plethora of activities ranging from hiking up volcanoes to racing an America’s Cup yacht, making Auckland an ideal place to tune into the many attractions of the Kiwi lifestyle. Catch a rugby match at Eden Park to immediately tap into the sporty vibe. One of the first things that one must do is to visit the waterfront precinct in the heart of the city. Twenty years ago, it was a rustic scene of fishing boats and warehouses but, following New Zealand’s victory in the America’s Cup yacht race in 1995, this area has been transformed with more than 30 bars and restaurants which line a marina crammed with yachts and launches. Head to the Sky Tower — Australasia’s tallest building at a height of 328 metres — for a bird’s-eye view of Waitemata Harbour, and the Hauraki Gulf and its many islands. The landscape of Auckland is dotted with small volcanic cones (which are dormant, so no worries) which in the past provided the natural defence for the villages. The two most popular ones are Mount Eden with the tallest crater and a 360-degree view of sprawling suburbs and One Tree Hill, which was home to one of the largest Māori settlement structures in the country. 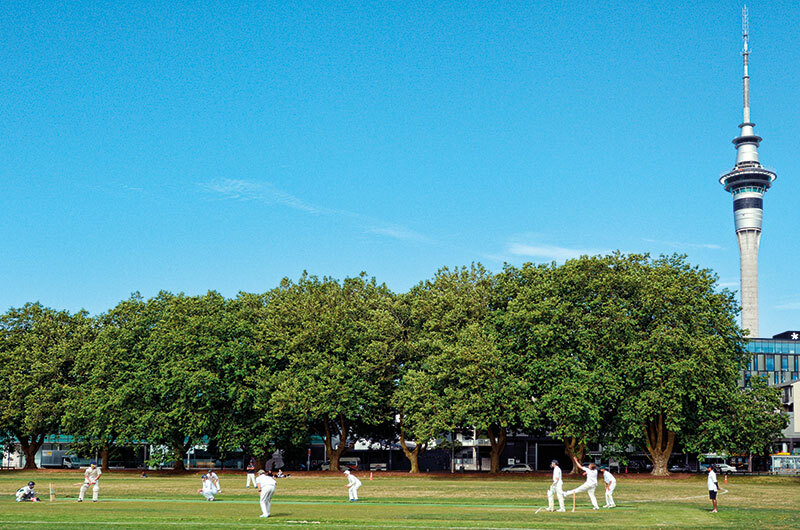 Take a walk through the gardens, walkways, parks and trails in the Auckland Domain, a beautiful, sprawling, 185-acre park sitting on a knoll, which is the site of one of the oldest volcanic fields in the area, with many walks and bike paths. Visit Auckland War Memorial Museum, the country’s oldest and largest museum. It is home to millions of objects and showcases New Zealand’s history, geography, ethnography and culture. Don’t miss a visit to the Wintergardens which has Victorian-style greenhouses, lush flora, a pond and a formal courtyard. Have dinner at Victoria Park Market that was originally a refuse station, its generator room providing power for Auckland’s first electrical street lights. Today it’s registered with the New Zealand Historic Places Trust as a Category I historic area and has been reinvented into an upmarket complex of boutiques, bars and restaurants. Mission Bay is the playground of the city with a great stretch of beach and a promenade lined with cafes and ice-cream parlours. The beach is safe to swim in with brilliant views of the gnarled lava landscape of Rangitoto Island. You can kayak or paddle board in the waters or cycle, run or rollerblade on the promenade. Finish your evening with a movie at the art deco-style theatre here. For a cultural afternoon, visit the Auckland Art Gallery that has on display portraits of Māori leaders apart from works by Cézanne, Matisse and contemporary Kiwi artists. Parnell is one of the oldest suburbs with some of Auckland’s most beautiful churches and historical houses. Parnell Rose Gardens, with its beds of flowers and towering native trees, is a great place for a stroll. For some retail therapy, head to Britomart, Auckland’s newest shopping district in a historic part of the city, with designer boutiques, bars and cafes. If you are there on a Saturday morning, head to the farmers’ market nearby and pick up some fresh produce. For a great day out, head west, towards the city’s rugged, wind-whipped coastline. Driving past the formidable monolith called Lion Rock with its Maori carvings, descend to the black sand beach at Piha, New Zealand’s most popular surfing spot, with its pounding waves and rough surf. Walk on the black glittering volcanic sand surrounded by dramatic cliffs, and native bush and drive down to the Waitakere Ranges, a region of pristine native bush, rainforest reserves, plants and wildlife, including kauri trees used by the Maoris for carving, and building boats and houses. For the active, the Hillary Trail — a self-guided, four-day trek through 77 kilometres of native forest connecting various park tracks and basic campgrounds — is highly recommended. If you have the time, take day trips to the Waitomo Glowworm Caves where you will be awed by thousands of twinkling lights in the grotto. Follow it up with a visit to an enchanted land with the Hobbiton Movie Set, a significant location used for The Lord of the Rings trilogy and The Hobbit films. It is easy to feel at home in Auckland that offers much more than a gateway to this safe, friendly and super-scenic country.